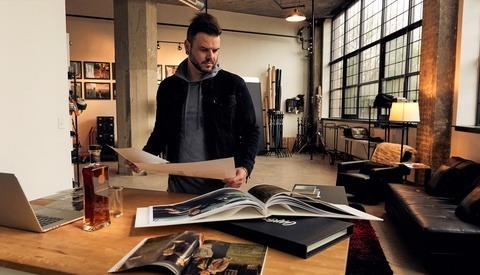 From my arduous time in the music business and traveling all over the United States, I learned the art of consolidating, cramming and compacting. 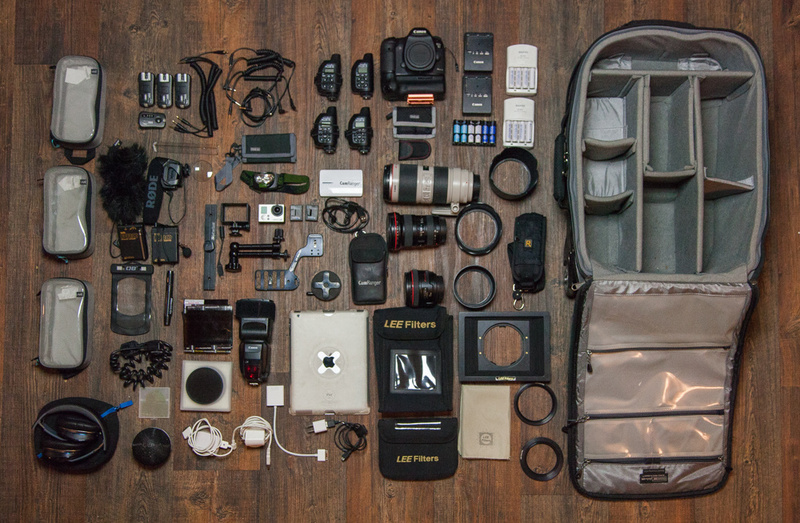 When I first started shooting, everything I owned could be fit into one camera bag and case. I traveled with a slew of speedlights, miniature lightstands and a collapsible softbox. It was the ultimate mobile setup, but after time my clientele grew and so did their demands, which needed proper equipment for capturing the overall vision safely. Over the past two years, my team has developed a system of break-out and break-down that requires a small footprint and very little time. As I acquire more and more equipment, we’ve hit speed bumps and had to adapt. But, the system has held up shoot after shoot, time and time again. 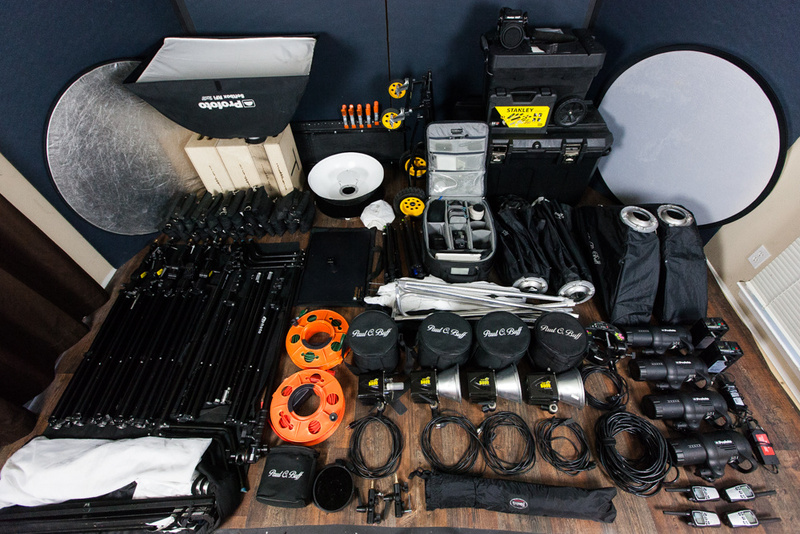 Whether you’re just starting with a few speedlights or travelling with 10 studio strobes, it’s good to have your equipment organized for time efficiency and client perception. 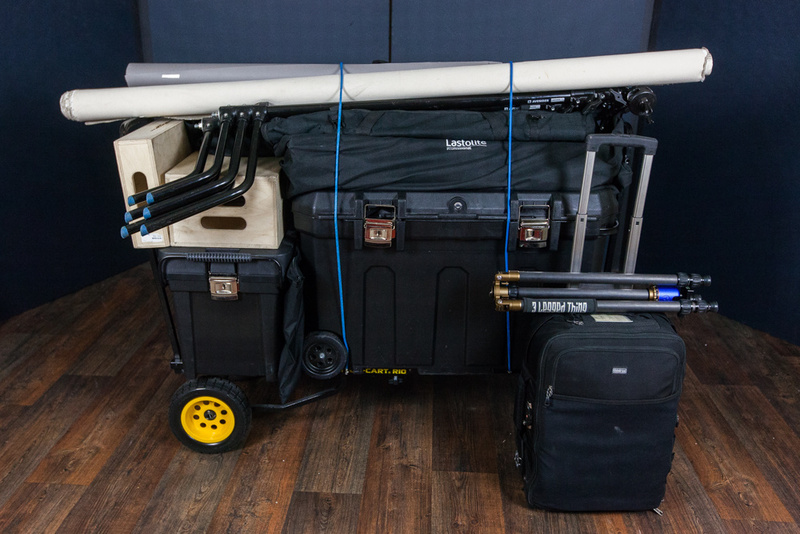 I bring the majority of my gear to nearly every shoot, as explained in this article “The Power of Perception – Creating A Reality For Commercial Clients.” There is a level of perception that plays into hauling a truck load of gear on location. Even though you may break out just one single light, the client will notice the equipment and feel as if they are getting more bang for their buck. It’s a common problem for photographers to throw around cheap light stands and allow them to slide all over the place during transport. 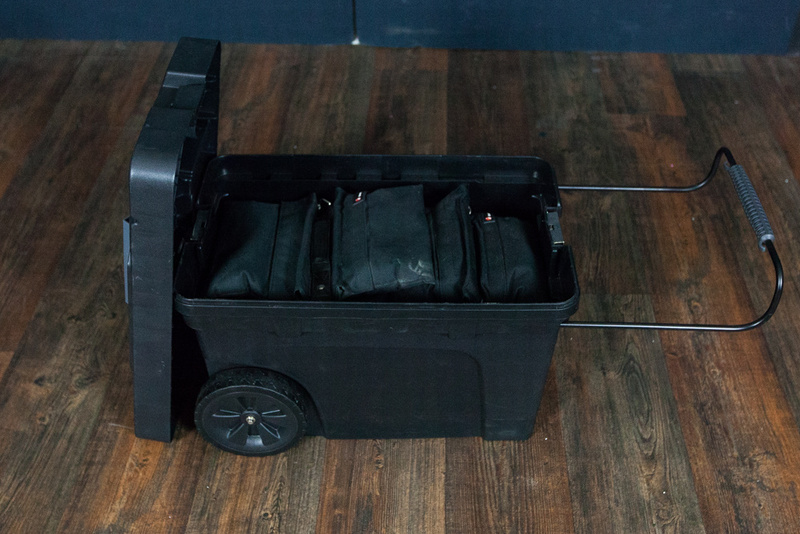 I’ve seen photographers use huge hardshell golf cases or bulky road capsules to haul their lights stands, but for someone with a small car… it’s just impractical. The Original Roll Up from the company Standbagger fits my needs perfectly. Standbagger was founded by photographer Steve Burns who created the product when he found a lack of products on the market. Since I cannot fit a gigantic hardshell golf case as well as “Stan” and “Stan Jr.” in the back of my car the Original Roll Up is befitting and can squeeze into small places. I do travel with several C-Stands which do not fit in the Standbagger but will break down flat and low profile that can slide into the smallest of clefts. This is one of the first decisions we have to make as a photographer. There are nearly two dozen major bag and storage companies fighting for your business day in and day out. 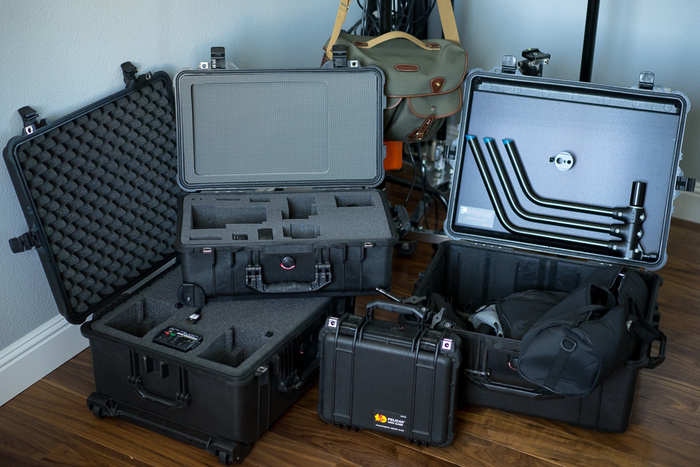 I’ve experimented and worked with numerous bags over the years and in my opinion Think Tank Photo provides the most efficient, durable camera carrying systems around. They are built for professional travelers and heavy duty users. The Airport Security V2.0 provides enough safe space for everything I need to get the shot. I also use and abuse the Think Tank Photo Memory Card Carrier and DSLR Battery Holder. For a full equipment list, click here. 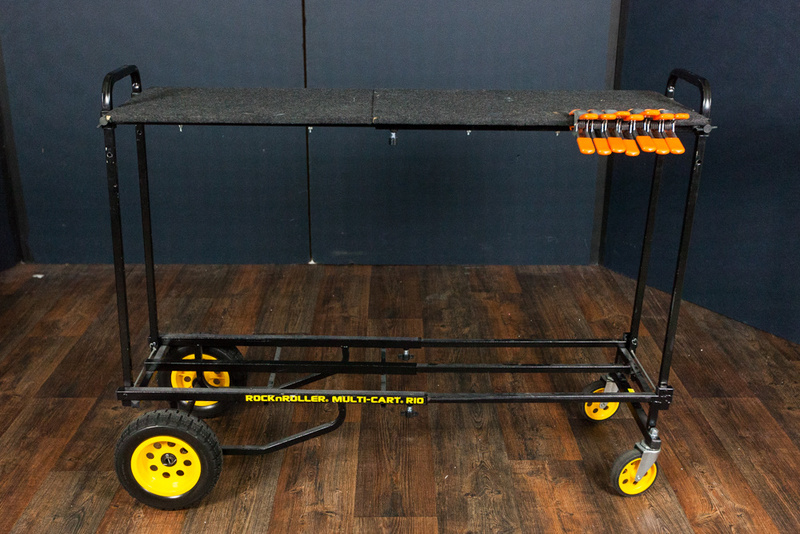 My friend Tony Roslund created an incredible and insightful article on the Rock N’ Roller Multi-Cart here. 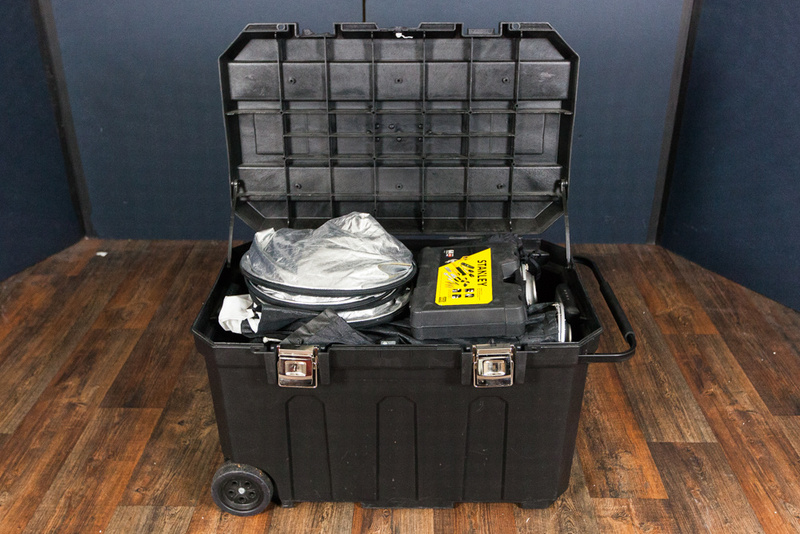 It’s all led to this; now that packing has been covered you’re going to need a vehicle that can hold your gear. Unfortunately, a beat up VW Beetle or a vintage Chevy Camaro just won’t do the trick. I’ve found that the hatchbacks or “toaster” cars work really well. 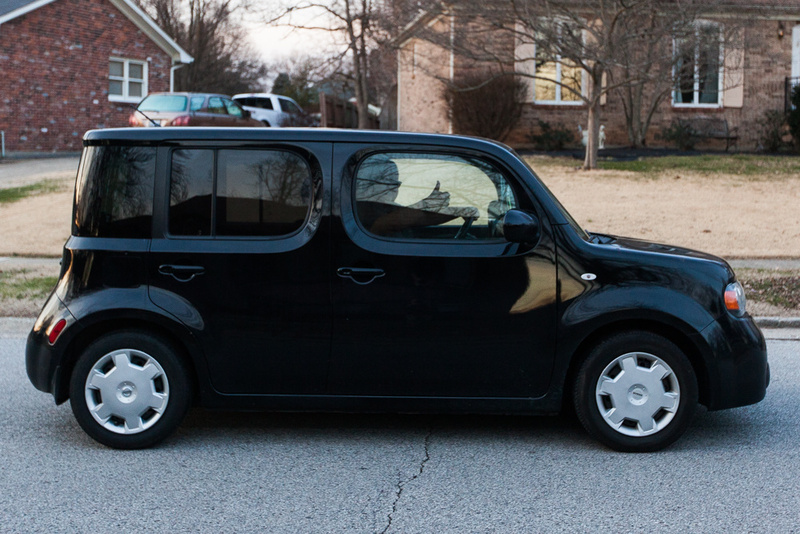 In my case a Nissan Cube; a strange looking car that has the tendency to turn some heads while driving down the road. But, the low overhead and large storage size is completely worth the bewilderment. I’m not here to tell you what type of vehicle you should own, but consider it an investment making the job more manageable. Aside from gas, a nice spacious car can make your life a whole lot easier. At the end of the day we all have different workflows and certainly different volumes of equipment, but I can only speak for what has worked for me. So, instead of throwing all that stuff in the backseat or dragging around a cardboard box full of cables and lights, invest in some heavy duty containers. I guarantee you’re on location workflow will become more organized and more affable than ever. Your back can thank me later. If you’re interested in hauling all of this gear on a part time basis, I’m currently accepting applications for my 2015 internship. If you're a young(18 - 25) photographer or photojournalism/marketing major looking to work hard and learn the ropes in the fashion and advertising industry, please email a current resume and current portfolio to info@claycookphotography.com! Must live within 150 miles of Louisville, Kentucky. I notice you use v-flats quite a bit. Do you just have to rely on flags and reflectors when you hit the road? That is correct Thomas, I can't haul my V-Flats around, so I do relay on reflectors on location if I need to cut light or bounce it. Very cool, love the Stanley Job Box tip too. Great article Clay. I think you win the award for "how much sh*t can be crammed in a small space". 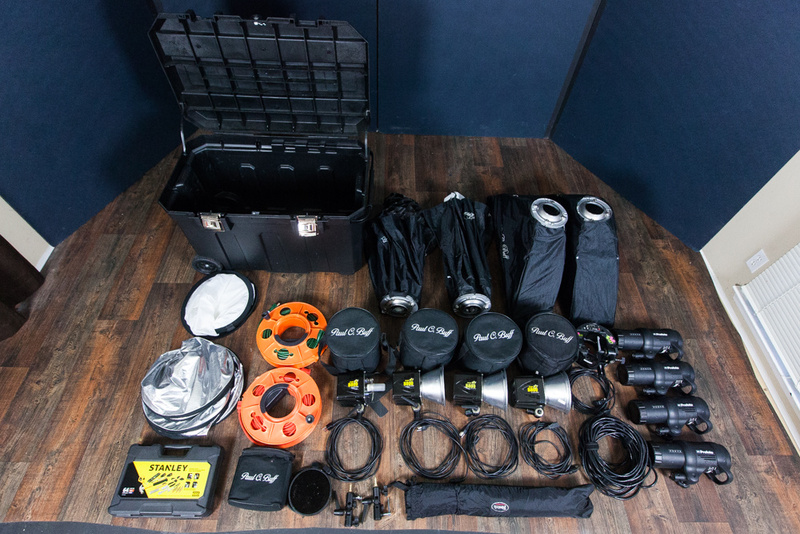 I would have never guessed you could fit all those modifiers and strobes in one box. Thank you Jason! LOL! It definitely comes from my experience on the road. You just have to be really good at human "Tetris"
Great Article Clay, this really helps put things in perspective! Thanks for the tips! Thank you Stevie! Hope all is well my man! This is great, that's for sharing, Clay! I'm starting to use strobes/speedlights more now and going mobile a few times a month (I'm just a hobbyist). So over the holidays I've began to put together my own travel kit as well, especially since I've already had a few Pelicans laying around and just got a small Gruv Gear cart. I'm working on customizing the interior for the most compact storage I can manage and getting a few DYI arrangements inside boxes. Since I'm a one man show the goal for me is to be able to unpack-ready-to-shoot in 10min or under including tethered setup. Thanks for the tip on the "Stan"... I might have to consider it for all the soft boxes! Can't wait to wrap this up in a few weekends! Very Cool Alexander! While I could go the route of Pelicans, I would spend a fortune. I need a lot more space. The Stanley boxes work great for my needs. Looks like a great setup! Cheers my friend! Hey Clay, amazing article. Definitely a huge help as I'm trying to figure out how to move things. I'm not a driver though and live in NYC so definitely not easy. One question! I see you have both alien bees and profoto mono blocks, is this just to have up to 8 strobes available, or do you have specific uses for each type of strobe? Thank you Aleksander! It's a mobile setup that would work well for many applications. Walking far distances in NYC is not one of them. But the Multi-Cart might be a worth investment! I love the Paul C Buff modifiers, that is why I still use the Alien Bees. But I only use them for background or kicker lights. Profoto is always my key. Makes perfect sense, thanks for the reply Clay! You've got some amazing work! I saw this setup firsthand back in October and still cannot believe you got all of that into such a consolidated setup. It is definitely efficient and works well. One question though Clay, looking at your camera gear, you do not have a spare camera body and if so why? I guess if it breaks can always rent one before hand or steal an interns? I do own another camera, I just do not pack it. I just rarely take it with me. A quick drive back to my home studio is better then sacrificing the space. But, using a interns camera is an easy fix as well! Gotcha... And thanks for the reply. Great article! And what about flights? 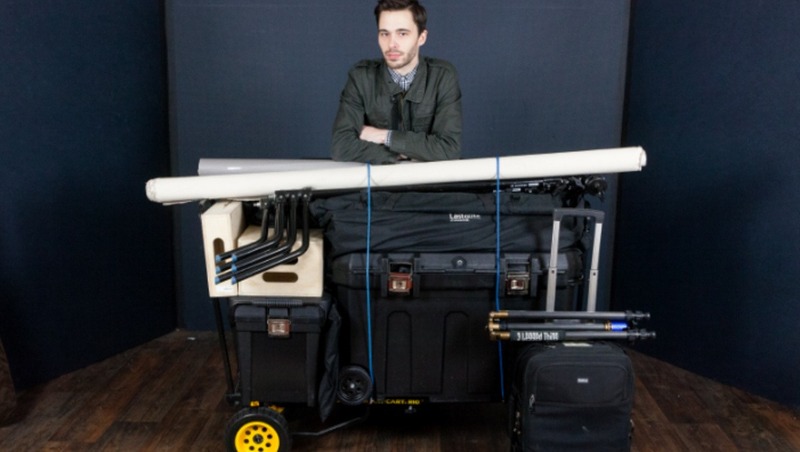 How do you transport your studio lights, softboxes, tripods ... in case of flying? Flying is an entirely different ball game. Unfortunately, I cannot fly with this amount of gear. So I travel with just 4 strobes and small selection of modifiers and rent whatever else I will need. I use Think Tank cases for transport. Thanks for replying! And transporting the strobes on a plane, I guess your Think Tank cases aren't carry-ons? Are these bags sturdy enough not to get the fragile equipment damaged? Any experience with that? 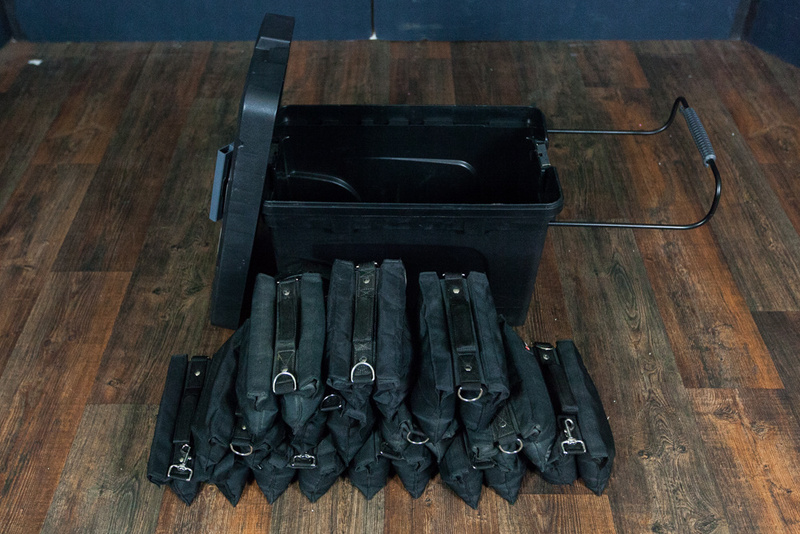 Think Tank bags are built rock solid. I always make sure the strobes are packaged well before checking them! Never had a problem so far. I'm in the middle of re-tooling my kit for portability.... 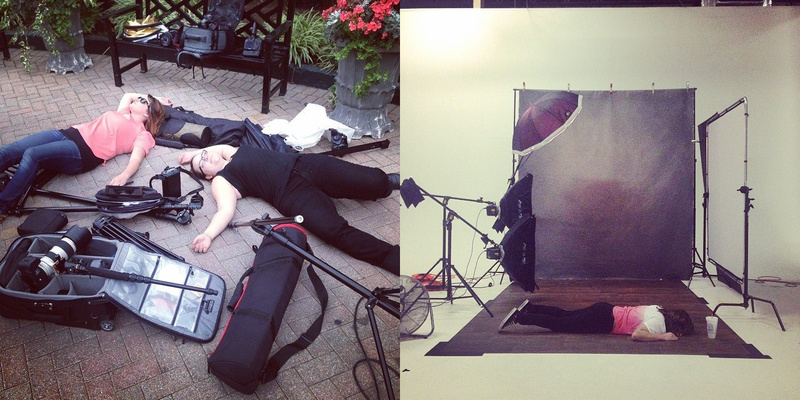 It looks like you are using a mix of C-Stands and Manfrotto 420b Combi-booms... I currently have one 420b but have been debating adding a 420csu (steel base version) or a C-stand. I am wondering you opinion on the manfrotto's stability with a strobe and what looks like a PLM/softlighter in the bottom photos, mine starts to arch a bit when I hang an Einstein off the end and I worry. Also a keyboard case works great for moving larger grip pieces... I scored a used one at a local music-go-round for $70. Super padded, lots of handles, and has wheels. Thank you for reading Andrew! The 420B Combo Boom stands have been great for me. They are more portable than a C-stand and the ease of use can't be matched. I've put a ton of weight on the end of the stands and never have had a problem. Just make sure the feet and crossbars are sandbagged to hell! Right on! Thanks for the tip! Hope this helps! The apple boxes seem a bit excessive (in cost by B&H) don't you think Clay? Did you try to DIY it or find it locally at apple farms for less, or similar boxes at antique shops/flea markets, etc.? Thanks for checking out the article Chris! If my client is standing on it, the last thing I want is a DIY solution that has the possibility of collapse. That is just common safety. I do have boxes for staging props and looks, but I never have a client stand on them for stability. I noticed those props too, did you pick those up at antique shops? They have great texture to those. Sure did Chris. I tend to hit the antique malls about once a month. I have quite the collection of chairs, stools, boxes and ladders! I wish someone would produce an apple box that would open on a recessed piano hinge so I could fill it with "stuff" I could then justify the space for these handy dandy boxes! A recessed hinge would allow normal stacking and packing. If anyone knows of any PLEASE let me know.